Some Jews will not eat anything cooked with matza on Pesach - including matza meal. (I'm not included in that group, BH.) They refrain from eating any food that is gebrocht. (The Hebrew term is matza shruya, but since this custom originated in Eastern Europe, the Yiddish name is used much more.) When I asked about the etymology of the term, someone guessed that perhaps it was related to bracha - blessing. That's not correct, but we'll get back to that association later. The term gebrocht means broken - as one would break matza into soup. As this site explains, "The past participle of Yiddish verbs is formed by adding the prefix ge- and the ending -(e)n or -t to the base of the verb." So gefilte fish is filled (stuffed) fish: "ge-fill-t". And broken matza is "ge-broch-t". Since German and English are closely related languages, we can easily see how these words developed. A slang term for bankrupt is "broke", and this leads to a question that appears on those list of silly questions floating around the internet: Why the man who invests all your money is called a broker? One school connects it with tapping into or broaching a wine cask in order to sell the wine - in fact, this school claims that broker derives from the same source as broach. Both words supposedly come from French broche "awl" (from Latin broccus "projecting"). The Latin derives possibly from Gaulish, as there is an apparent Gaelic cognate: brog "awl". Incidentally, even if broker does not derive from the French broche, the word brooch (which was spelled broach until quite recently) certainly does. Another school propounds the theory that the word comes ultimately from an Arabic source. The Anglo-Norman form of the word is thought to have been brocour, and a variant was abrocour. There was a Spanish word alboroque "sealing of a bargain" as well as Portuguese (one of the most interesting sources of English words) alborcar "barter", both likely coming from Arabic (with the al representing the Arabic definite article). Earnest Weekley notes that we see the Spanish word as early as 1020 and that its derivation from Arabic (or Hebrew) is supported by the fact that many brokers in the Middle ages were Arabs or Jews. Weekley notes another possible explanation (though he favors the Arabic source): Anglo French broucour "one who broaches a wine cask and sells the wine". There was a variant, abroucour, whose Medieval Latin equivalent was abbrocator, and this may have been confused with or influenced by Medieval Latin abbocator "a broker" or literally "one who brings a buyer and seller mouth to mouth", boca being Latin for "mouth". So you can see there is at least one theory that provides a connection between a word sounding like "broke" in English, and bracha in Hebrew. Here's one more, although I'm not sure whether I believe it. There are those who think that the origin of the term "break a leg" (a way to wish luck to someone before a performance) is in Hebrew. Germans say Hals- und Beinbruch, “neck and leg break”, as ways of wishing someone good luck without any fear of supernatural retaliation. 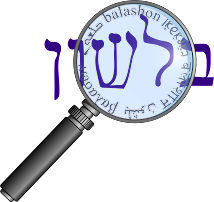 It is sometimes said that the German expression is actually a corruption of a Hebrew blessing hatzlakha u-brakha, “success and blessing”, which may have been borrowed via Yiddish. Whatever its source, the most plausible theory is that Hals- und Beinbruch was transferred into the American theatre (in which Yiddish- or German-speaking immigrant Jews were strongly represented) sometime after World War I.